Harold E. Way amassed a collection of 3,400 photographs of Knox College and about two-thirds of those are on display in this collection, culled from Harold Way&apos;s scrapbooks. The volume of materials collected attests not only to Harold Way&apos;s interest in the science and practice of photography, but to his love of Knox College. The earliest photographs are from the 1890s, the latest from the 1940s, and document in detail the events, people, environment, and the general life and culture of Knox College in this 50-year time span. 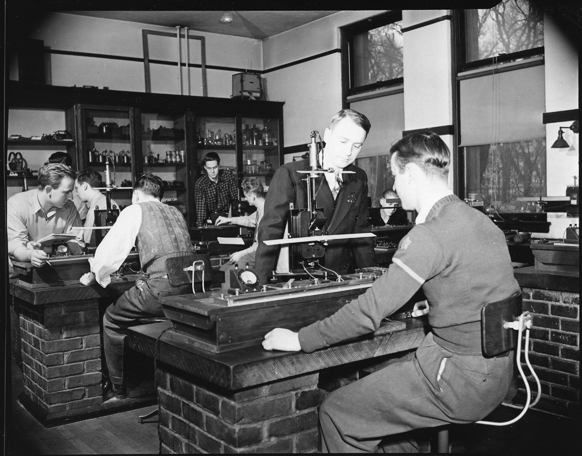 Prof. Harold Way (center) teaching physics in the lab at Knox College. Harold Way earned Bachelor of Science degree from Knox College in 1925 and returned to the College just two years later as an instructor in the Physics department, where he taught until 1947, having received his doctorate along the way from the University of Iowa. He also served the College in various ways administratively: Admissions Counselor, Assistant to the President, Acting President and Vice President. The Knox Alumni Association recognized his ability and merit with an Alumni Achievement Award in 1943 and he was awarded an honorary degree in 1971. Photography as a subject of study was first offered at Knox College in 1910 through the Physics department. Harold Way not only taught photography, but he was the College&apos;s unofficial photographer and documentarian for many years. In 1928 Way wrote a letter to College administration asking for funds to purchase a new camera with lenses for $250.00. He even suggested that if the College could not make the purchase that he would use his own money to do so and could then take pictures for other faculty who have indicated interest in having pictures taken. In a memo to President Albert Britt, Knox&apos;s treasurer, Kellogg D. McClelland, advised the President that the College could not buy the camera and went on to say, "I am skeptical as to whether Mr. Way would find sufficient demand for pictures to warrant his buying and owning the equipment himself." Way proved McClelland wrong about this, as this collection demonstrates. Way not only found enough demand for pictures from his own time at the College—documenting sporting events, theatre productions, classroom activities, social events, Homecomings, commencements, the Lincoln-Douglas debate celebration, the renovation of Old Main, the centennial of the College, and the general environs of the College. Way even produced prints from negatives and slides (probably stored in the Physics department) from years before he attended Knox, even from the years before he was born, further documenting the life of Knox College.